Knee pain is something virtually all of us hard-training folks encounter at some point in our life. The cause of the pain can be attributed to many possible problems such as a fallen arch or weak outer hip muscles. 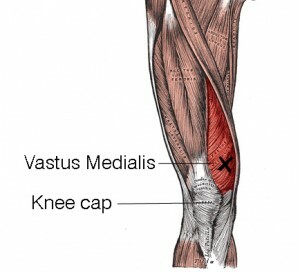 However, your vastus medialis muscle is often a major factor because when it’s weak it can’t hold the patella (knee cap) in its proper alignment. Faulty alignment of the patella can irritate the patellar tendon and cause pain below the knee cap. I prescribe strength exercises for the vastus medialis whenever a client comes to me with knee pain and it always helps. It might not completely rid the person of knee pain because, as mentioned, there can be other factors at work. But sometimes it’s all that’s needed. Whenever you have joint pain, start with the simplest solution first. Strengthening the vastus medialis muscle should be your first line of attack. The lowest portion of the vastus medialis, closest to the inside of the patella, is thought to contain fibers that run in a more oblique direction than other parts of the muscle. These vastus medialis obliquus (VMO) fibers are often mentioned in clinical settings as being the ones that are typically weakest and most difficult to recruit. The jury’s still out with regard to the possibility that those VMO fibers even exist because anatomists have had a tough time finding them on cadavers. In the past, trainers and physical therapists often used the leg extension exercise to strengthen the vastus medialis. On paper, this approach seemed valid. However, in practice it rarely helps and sometimes exacerbates the problem due to the large shear forces that accompany the leg extension movement. The best exercise I’ve found to increase the strength of the vastus medialis, and maybe the VMO (if those fibers exist), is the step-down. It effectively strengthens the vastus medialis without putting excessive strain forces on the patellar tendon. When you perform the step-down correctly, you’ll feel tension directly on the inside of the knee, in the vastus medialis. The video below shows the proper technique for the step-down. But before you watch it keep these three points in mind. 1. Perform the exercise slowly: it’s not easy to target the vastus medialis so you must move slowly to develop the mind-muscle link you need to activate the correct fibers. Push through the ball of the foot on your working (elevated) leg throughout the contraction. 2. Hold weights if necessary: if you can easily perform 15 reps without feeling much tension in your vastus medialis, you’ll need some external load. Start light, maybe a pair of 20-pound dumbbells if you’re a strong guy, and work up from there. 3. Stop if the exercise causes more pain: prescribing rehab exercises is rarely simple since your problem might be more complex than one exercise can fix. With the step-down, or any other rehab exercise, if you experience more knee pain after the exercise you should not continue. You should feel less pain and more strength around your knee after each set is finished. 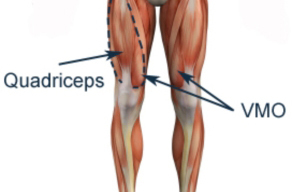 Step-Down: perform 3 sets of 15 reps with each leg, every other day, until the knee pain goes away. Finally, I’ll be covering all of my best joint rehab exercises in my seminar in Phoenix, AZ on February 2-4. To find out more seminar details, click this link. This entry was posted in Relieve Joint Pain by Dr. Chad Waterbury. Bookmark the permalink. Is there a difference between the step down and the Peterson step up? Have you found the Farmer’s Walk to help with knee pain (as it strengthens the vmo eccentrically)? Thank you, Chad!! And a happy new Year. CW: Yes it’s a similar exercise. FW is good, but the step-down targets the area more directly. CW: This exercise is good for most types of knee pain. Try it and see. Whatever type of squat that doesn’t cause pain is fine. Great article! So if I have Patellar tendinitis aka “jumpers knee” , this exercise might be good for me? CW: Yes, try it and see. Just finished Get Strong and looking to try out HFT for arms starting next week. (I asked you about using it with the Waterbury Diet on your last article, thanks for the answer there) but looking at my schedule for the next 4 weeks I want to try I may have some long shifts that won’t allow 2-a-day sessions, would changing to workouts every day in a row for one of the 4 weeks change the program too much? I’d do the full body M-W-F and then the arm workouts T-T-S. If it’s more beneficial to do 2-a-day’s I can wait to get started till after my busy stretch. CW: It’s better to do the 2 workouts on the same day. Wow, best timing, my doctor say to me to strengthened the vastus medialis because of a loose knee cap. I will try your exercice. What do you think of the backward sled drags or the terminal knee extension for the same problem? Can i make a circuit with this 3 exercices like a warm-up or a finisher ? or work on my day off? 1. Can i do the plp in the same time of boxer drill ? CW: The backward sled drag and TKE are both excellent exercises. Yes, a circuit of the 3 exercises would be good. For your other three questions: yes to all. To add to my above question, would it make more sense to just do the 2 daily sessions as one longer session and make sure I get a good does of carbs/protein right after? That way I’d only be training 3 or 4 days a week on the days I’d be having the extra protein as part of the WD? CW: It’s better to split up the workouts, thus taking advantage of the post-workout window twice per day.